To ensure that your next IT system installation goes as planned, choose Tophill Traders to oversee the entire process. We are proud to provide the experience and certification to design, build, and install your network system. We offer a service that is cost effective, quick to respond, and flexible in tackling even the most challenging IT system installations. Tophill Traders has the expertise, resources, and experience to handle any new network installation, so don’t bother with limited services, or multiple vendors for one task. Tophill Traders can see to all your business’ installation needs through a single service, so get in touch with us today for more information. Keeping your business running smoothly requires building and maintaining a robust, highly available network. Tophill Traders offers proven network design and implementation services that drive results for your business. From wireless networking with VoIP, to multi-location WAN intranets with mobile-ready remote access, to cloud-based storage and retrieval systems, Tophill has the experience and capacity to deliver reliable, single vendor solutions. Tophill’s network design and implementation services begin with a comprehensive needs analysis. Our team evaluates your current business and assesses your future needs. They consider your budget parameters and design a network to meet the challenges of your business today and tomorrow. Once designed, our engineers and project managers install the network and document a set of standards and procedures with suggested security policies to assure network integrity post installation. With Tophill, you can rely on our people, processes, and technology to provide networking services that drive results for your business. 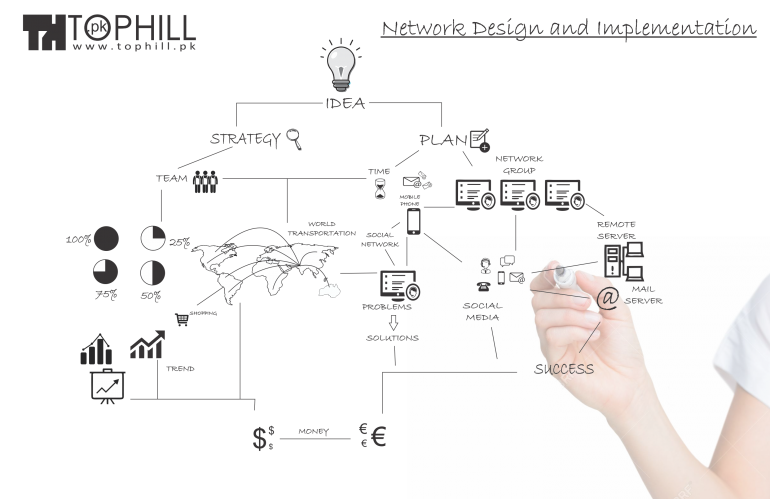 Contact Tophill to ask about our network design and implementation services today. Application Mobility. With increased IT challenges resulting from the explosion of devices and user requirements, Tophill has leveraged virtual desktop and cloud technologies providing secure and compliant access from anywhere to corporate applications and e-mail with a familiar user interface. Network Services and Unified Communication. Tophill technology solutions transform business effectiveness with network-based infrastructure services. With Tophill, your network becomes a platform for innovative services that improve both user and customer experiences with innovative integrated security, wireless, voice, video, and data networks. Server Virtualization. Make the most of your server investment dollars with server consolidation and containment solutions to lower cost, improve server utilization and increase operational efficiency. Data Storage. Tophill delivers innovative storage systems to meet your growing data storage and data management needs. These technologies can provide everything from simple file services to advanced snapshot capabilities and replication services. Data Protection. Data protection allows you to do everything from restore a lost file, recover from a virus infection or the complete loss of your facilities. Tophill recognizes that different organizations and different data sets have varying protection requirements and therefore supports the leading technologies to meet any of these needs.